At yesterday's presidential inauguration the media emphasized some of the differences between Barack Obama and George W. Bush, and for good reason. However, I couldn't help but notice one thing they share in common. In fact, every president of my lifetime, from Ronald Reagan to Obama, has had this one thing: swagger. 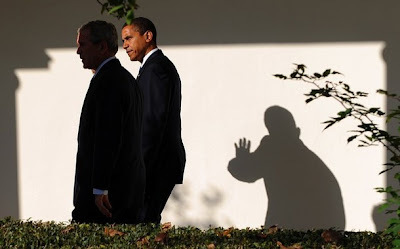 You see it in the way Bush and Obama walk, the way they talk, and what they say. Americans love cowboys and they love them in office even if they might not need a hat, gun, or horse. It was a startling revelation I had this past week, and one that I haven't heard mentioned by the mainstream media. It seems to me that in order to win an election you have to have swagger. Hillary Clinton, John McCain, and John Kerry didn't have it, and you know what happened to them. I'll have another lager, please.